In the highly competitive world of automotive engine installation exchange, the consumer needs to be aware of certain factors that can save them from unnecessary expense, headaches, and misunderstandings. Statistics show that one of the main problems is that consumers choose their automotive repair shop based solely on the cheapest price estimate they can find- only to regret it when it's too late. Automotive engine replacement or rebuilding is a major investment for most consumers. When consumers call any repair shop for an engine exchange installation (or rebuilding) estimate, companies have a tendency to tell them what they are going to give them, NOT necessarily what they will probably need in addition to the request. Most consumers don't know what's involved in an engine installation or rebuilding. For that matter, many don't even know what constitutes the "engine." Engine installation companies are aware of this, along with the fact that other items will inevitably be needed in conjunction with the engine installation. Some make you aware of this fact BEFORE they begin the work and some don't. From the consumer's point of view, however, this poses a concern in that the engine company does not know conclusively to what extent other items are needed until the vehicle is brought in and disassembled- since obstructions and concealments exist with the engine in place. In other words, when the consumer calls for a price quote, they are getting just that- a price, not the actual cost it might take to fix it right. No professional engine installation company installs a replacement engine in any vehicle without examining vital areas that could adversely affect the engine's performance and life. To do otherwise would be suicidal and an injustice to the consumer. The biggest injustice, however, is that in many cases the consumer is not made aware of this scenario beforehand. Some of the items that professional engine installation companies inspect, for example, are the cooling system's radiator, water pump, thermostat, hoses, & drive belts. If these items are reused and fail, the new engine could be damaged from overheating, voiding the warranty. It it therefore commonplace and logical for professional engine installation companies to go through an extensive examination of the engine's surrounding environment to make sure nothing jeopardizes the new engine installation. Thus, recommendations to change certain items that appear old will be recommended. The decision in all cases is yours, of course. But remember that the declining of recommended repairs that cause a problem with the engine may void the warranty. Nevertheless, when deciding which engine installation company to use, keep this in mind: If something sounds too good to be true, it probably is. And, be very aware of engine installation companies that consistently bait you with cheap, come-on price quotes because this may indicate a scam besides the fact that the company may be employing less skilled technicians and/or selling inferior products. All of this can result in repeated rechecks and wasted time bringing your vehicle back and forth for the same problems. One good suggestion that can give you an idea as to the reputation of a company is by searching the name of the company in a good search engine like Google and put the word "complaints" or "rip-off" after it. If there's any complaints on the company, it will come up in the search listings and you can read about it. In some cases companies hide behind a different name after having continuous complaints and/or problems, therefore you may have to question if they have operated under another name in the past. Never do business with any company you're not familiar with without doing such a search, whether it be a product or service you are looking for. Furthermore, don’t be deceived by a 5 star review rating of a company when there is only one review. That review may be from the owner’s family or himself. In regard to our company, we invite you to do a BBB rating search for the company you are interested in doing business with. Just go to their website located here: http://neworleans.bbb.org/Find-Business-Reviews/ and fill in the form to see the company's rating and in the "search results" click "view reports." We at present have an A+ rating with the same name for over 35 years. Check our rating: http://www.bbb.org/NOLA/business-reviews/auto-repair-and-service/labella-s-auto-repair-inc-in-kenner-la-9001731/ . Keep in mind companies that have no rating most probably have changed their name due to bad reviews. At LaBella's Auto Repair, we let you know about the ramifications of engine installations and your options in writing BEFORE we begin the work. FACT: "JASPER has been remanufacturing quality products since 1942 and today we are the nation's largest remanufacturer of gas and diesel engines, transmissions, differentials, rear axle assemblies, marine engines, stern drives, performance engines, and electric motors." Info taken from: http://www.jasperengines.com/about-us.php . The choice is yours; both have the same identical nation wide warranty. The latter is much more expensive. We sell both. It's your choice. Will I need other items besides the engine? Like with any repair in the automotive mechanical repair business, the surrounding environment comes into question since components work together and function dependant on one another. Engine installation is no exception. For example, overheating is one of the main problems with engine damage. Therefore, items like your cooling system, drive belts, water pump, radiator & hoses, etc. need to be in good condition or they can adversely affect the engine's life and performance. Warranties do not cover damage due to overheating, and engine remanufactures tag their engines with special heat sensor tabs that melt when overheated to indicate this. So to insure successful engine installation, many shops use a check list to inspect items of concern and then these items are presented to you in the form of an additional estimate. However, such items cannot be fully determined until the engine is removed from the vehicle and inspected. This is because many items cannot be examined when obstructions exist in the engine compartment. The condition and age of your vehicle determines to what extent other items may be needed. For example, rubber components such as hoses have a 4-year life expectancy. Ultimately, you have the choice to decline any recommended items but doing so can cause engine damage or breakdown which can jeopardize the warranty. A word of caution on engine quote sale's pitches: Be aware when a sales persons tells you on the engine job price quote that it "includes all your gaskets & seals." As mentioned earlier, companies like telling you what they are going to give you, but sometimes it is items that you normally get anyway- already included in the price quote. Nevertheless, this type sale's pitch is comparable to a car salesman telling you that the new car that you are inquiring about includes a steering wheel and all of the tires. Another sales tactic employed to get the edge on the price-shopping playing field is the use of grading engines in letter categories (grade A, B, C) to indicate their quality. This is done to play down the competition's price quote despite the fact that engines are never graded like dairy products- only by the mileage and/or warranty they carry. Reputable engine installation shops only deal with quality engine providers they have a long-time relationship with. They do not shop unfamiliar companies where the product's reliability may be in question and where the company may be here today and gone tomorrow when warranty issues arise. "Rebuilt" versus "remanufactured" engine? (What's the difference?) The term "remanufactured" indicates that the engine was completely reconditioned to the highest specifications in all areas in a factorylike facility where all the machine shop equipment and procedures are carefully monitored and performed routinely. Engine remanufacturing is a precession work, performed by highly skilled machinists. As mentioned, the engine is completely reconditioned in every area- not just in the broken or bad areas. (click to see what is included in our remanufactured engines). Remanufactured engines are sold on an exchange bases in most cases- meaning your old engine (core) is turned in as an exchange. In many cases it must be in good condition, no holes, cracks, or excessive damage to the block or heads or a core charge may apply. Remanufactured engines are the best quality engines you can buy when compared to having an engine "rebuilt." Requesting a "rebuilt engine" or "rebuilding" an engine may be a costly mistake. For example, the rebuilder may only make partial repairs to the engine, cleaning or not replacing items that otherwise would be addressed in a remanufactured engine. This could mean, for example, that the camshaft or crankshaft if not severely damaged may be cleaned and reused along with other internal items. Reusing and not reconditioning or replacing such items can cause early engine failure- often not covered by the warranty. Also, the engine must be in "rebuildable condition" to have this performed. Sometimes engines are damaged beyond the point of rebuilding. However, this cannot be determined by the repair shop until the engine is removed and completely disassembled and inspected. Even if the engine is running, doesn't insure that it can be rebuilt. Some engines, for example, may have already been bored out (cylinder block piston bores) to the extreme, making re-boring impossible. This can be a "Catch 22" situation for the consumer, because if in the event it is discovered that it is not rebuildable, then another engine will be needed at additional costs- often times costing considerably more in both labor and whatever another engine will cost. Some shops only quote rebuilding engines (or rebuilt engines) because they know that they can quote a lower price in comparison to shops that quote prices for quality factory remanufactured engines. However, in many cases this is to get you into their shop knowing that there's a good possibility the engine is NOT rebuildable- discovered after disassembly. Even if you decline the additional price quote for another engine & labor, you are now obligated to pay the labor charges up to the point you declined the work. What exactly is the "engine" or "engine long block" or "short block?" This is a good question if you are not a technician in the business. 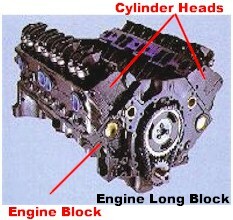 The "engine" or "engine long block" plain and simple is the cylinder head(s) and block with its internal components (click to see what an engine long block looks like). In most cases it does not include components like intake & exhaust manifolds, oil pan, alternator, carburetor or fuel injectors, or any accessories, or anything not constituting the "engine" itself. These components are transferred to the new engine if not damaged. Sometimes consumers ask for a "short block" installation. Often this kind of request is based on misunderstanding of the term. In any case, a "short block" is not the "engine" as earlier defined but is the lower half of it- without the cylinder head(s). Asking for half of an engine is not only an improper repair request, it may also prompt an improper repair procedure by someone inexperienced in the business. To make such a request suggests that you want the old cylinder heads to be reused on the new short block. If the heads are old, warped, or have valve problems, the engine will not run properly and could damage the new short block. Sometimes customers want to use the same old heads because they claim they were recently replaced. However, if they were replaced before the engine failed (indicating the heads were used on the engine at time of failure), the heads could be damaged. Short blocks generally do not carry more than 6 months warranty and warranty may be voided if old heads are used on a new short block. Note: Inquires about previous mileage on a remanufactured engine long block or short block should never be a factor of concern for the consumer, since it has been completely remanufactured with no mileage accumulation on it until operated (run) in the vehicle to which it was installed. Asking an engine exchange company how many miles is on the new remanufactured engine reinforces to them that you have no idea about the product to which you are inquiring about. Don't make the costly mistake of basing your decisions for your repairs solely on cheap prices. Product Warranty... Virtually all products come with some type of warranty. Some warranties cover the product only to a certain degree. These are called stipulated warranties. This means that while the product carries a warranty, there are specific limitations. Those limitations protect both the consumer and the merchant. The weight of a warranty can indicate the product's worth or quality to a great degree. The best warranty in the engine installation business is those that back both the labor and the product. Some warranties as indicated only cover the labor for 90 days or less. This might indicate that the product would have a tendency to fail in the area of less warranty. At LaBella's Auto Repair, we offer you a choice: a nation wide warranty similar to that of our competitors or one that covers both parts and labor for unlimited mileage where available. Rapport with the BBB... Members of the BBB are generally interested in their reputation with the consumer. While all automotive repair businesses have some complaints, some have much more than others. How one responds and cooperates with the BBB when a problem arises, determines the reputation of that shop in regard to customer satisfaction. Some companies don't cooperate with the BBB in this regard, and their report will reflect this. Consumers can check with the BBB by way of their automated report system for checking a company's track record. LaBella's Auto Repair is in good standing with the BBB and has even received an award for doing so. Furthermore, we invite you to do a BBB rating search for the company you are interested in doing business with. Just go to their Web site located here: http://neworleans.bbb.org/Find-Business-Reviews/ and fill in the form to see the company's rating and in the "search results" click "view reports." We at present have an A+ rating with the same name for over 35 years. Check our rating: http://www.bbb.org/NOLA/business-reviews/auto-repair-and-service/labella-s-auto-repair-inc-in-kenner-la-9001731/ . Keep in mind companies that have no rating most probably have changed their name due to bad reviews.